From Alfa to Zagato and every possible make or model in between, Scott Williamson / Photodesign Studios of Southern California, a hot-spot of the car world, specializes in automotive and vehicle related photography. Scott’s career as a commercial photographer spans over twenty-five years of meeting and exceeding the challenges of both studio and location photography for the world’s leading automobile manufacturers, tuners, specialty builders and aftermarket suppliers. Scott’s unique approach goes beyond just photographing a car, he captures the form, design, and essence of some of the world’s greatest automobiles. As a result, he has earned a reputation with the OEM automotive industry, custom & hot rod builders advertising agencies and marketing firms as one of the top professional photographers in the country. With a client roster that that has included projects for Mercedes Benz, Lexus, Ford, Lamborghini and Ducati to name just a few, Scott’s work and distinct shooting style continue to gain attention, national exposure and appreciation as the model years roll by. 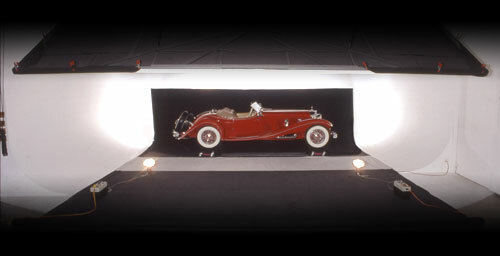 Selected pieces from Scott’s Automotive Art portfolio’s are included in the highly respected art collection of the Behring Auto Museum in Danville California and can be seen on permanent display at The Petersen Automotive Museum in Los Angeles. In turn, this has fueled commissions by well-known private collectors of antique, classic, hot rod and exotic automobiles to have their vehicles photographed and documented in the black background style that has become Scott’s "Signature Look". Testimony to this are featured articles about Scott’s talents in nationally recognized publications such as Photo District News, Petersen’s Photographic, Professional Photographer, The Commercial Image, Robb Report and Automobile Magazine.